Heresy in the Church is what a severe illness is to a human body. It is a cancer which if not expelled will endanger the spiritual health of its members. This is why the Church, the authentic Body of Christ, out of love and philanthropy, through its healthy members, the saints, fights heresies, just like the immune system of a healthy body fights the virus that causes the illnesses. However, it does not regard heretics as enemies, as indeed the Church has no enemies, but sick members whom it loves and tries to heal. Athanasius the Great fought like few ever have to preserve the truths of the faith against the heretics that tried to alter it, and they fought him furiously. With slander and all sorts of machinations they accomplished, many times, in exiling him and distancing him from his flock. Remarkably, out of the forty-six years he was Archbishop of Alexandria, sixteen he spent in exile. But even from there he never stopped fighting for his flock against heresy. Heresy creates factions and schisms, it splits and divides. Saint Peter of Alexandria had the blessing to see Christ, who wore a split tunic. When the Saint asked who split His tunic, Christ replied: "The fool Arius". The word "heresy" (αίρεση) comes from the verb αιρέω which means "to elect". Heretics choose a piece of truth that helps them to support their views and in turn reject the truth in its entirety. This creates many problems, because when the faith is altered the correct way of life is lost. This way of life is the method of treating the passions, the method of the purification of the heart, by which man is led to the knowledge of God ("Blessed are the pure in heart, for they shall see God"), since the vision of God is identical with true knowledge. Arius argued that Christ is not God, but a creation of God, "created in time", and therefore, like all created things, He has a beginning and an end. If this is true, however, then He cannot save man, since only God has that ability. But we know from Holy Scripture, as well as the experience of the Church, that Christ was incarnated to save and deify man. 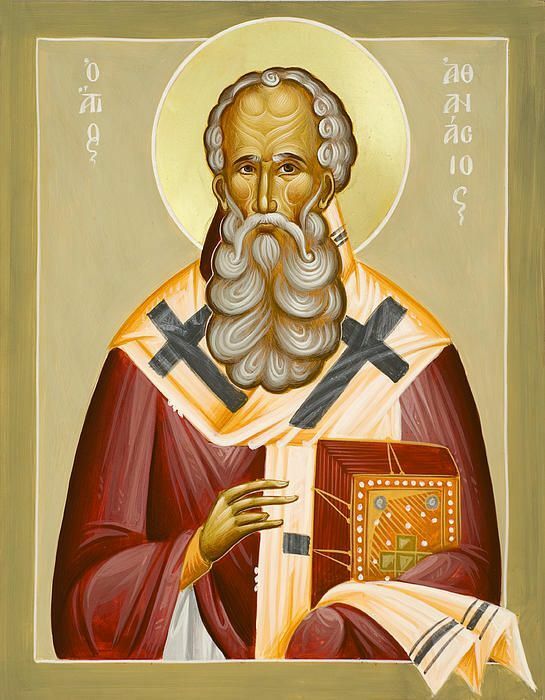 At the First Ecumenical Synod, which condemned Arius, Saint Athanasius participated as a young deacon (he was around 26) as a representative of the Archbishop of Alexandria, and with compelling arguments he showed the delusions and falsehoods of the teachings of Arius. And later as the Archbishop of Alexandria, with strong words, both spoken and written, he expressed clearly the truths that the heretics twisted. Namely, that Christ is not a creation, but "the Son and Word of God, the perfect offspring of the Father, begotten not according to will, but according to nature. He did not come about because the Father willed it, but because it is in the nature of the Father to beget the Son and in the nature of the Son to be begotten. This is how He differs from created things. He is the image and likeness of the Father, while man is simply according to the image and according to the likeness. He is without beginning, like the Father." The Church has given the epithet "Great" to few people. Among these Saint Athanasius holds a prominent position. It has been written of him: "Rarely has the epithet 'Great' uncovered such a substantial subject as in the case of Athanasius of Alexandria. He was great in zeal, great in love, great in holiness, great in Orthodoxy. With these qualifications he is now such a part of the living consciousness of the Christian people its as if he was alive physically." Even Saint Gregory the Theologian, in his memorial speech for Athanasius the Great, begins with the characteristic phrase: "When we praise Athanasius, we praise virtue." Indeed he was a model of virtue, since this is the fruit of true communion with the living Triune God. His memory is celebrated on January 18th together with Saint Cyril of Alexandria, and on May 2nd (the day of his repose). Source: Ekklesiastiki Paremvasi, "ΑΘΑΝΑΣΙΟΣ Ο ΜΕΓΑΣ", January 1997. Translated by John Sanidopoulos.